A neuroscientist at The University of Toledo is creating a new way to help people face their fears. 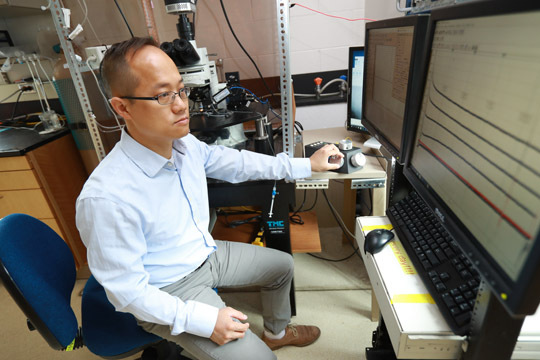 The National Institute of Mental Health awarded Dr. Jianyang Du, assistant professor in the UT Department of Biological Sciences, a five-year, $1.75 million grant to develop a method to modify fearful memories, which could lead to new treatment options for mental health illnesses, such as post-traumatic stress disorder, anxiety, depression and schizophrenia. Du, who studies how protons regulate brain circuits and behaviors, found in mouse brains that manipulating pH in the amygdala can influence or control fear memories during recollection, creating a short window of increased susceptibility to either erase or enhance the memory. Du manipulates the pH levels by using carbon dioxide inhalation and activating key molecular components of the central nervous system called acid-sensing ion channels, which spread throughout the body and allow for transmission of signals in the nervous system. The acid-sensing ion channels are important targets for pharmaceutical drug designers because of their importance to learning and memory. This entry was posted on Monday, July 9th, 2018 at 3:16 am and is filed under Natural Sciences and Mathematics, News, Research, UToday .